With the pollution, traffic, noise, and the hustle and bustle of Buenos Aires, you may quickly find yourself craving an escape to a quieter place for the day. Coming from a small city in the foothills of California, I found myself longing for nature sooner than expected after arriving in Buenos Aires. To satisfy this craving, my boyfriend and I took a day trip to a town on the river right outside Buenos Aires called El Tigre. We had asked a few Argentines where we should go for a day trip, and this was the recommendation we received. Unfortunately, I found myself feeling rather disappointed upon arrival. “Nature,” “clean” and “beautiful” are probably the last words I would use to describe El Tigre. However, on the bright side, there is a great outdoor market! We took the train to El Tigre from the Retiro train station. I actually really enjoyed the 30 minute ride because we were able to see a lot of scenery as well as what the neighborhoods look like outside of the city. Surprisingly, random mansion style houses were scattered about within close proximity to shacks. The train also went along the edge of the river, which was a pretty sight. Unfortunately, the water is very dirty and brown. El Tigre is not very big, but it does contain an amusement park, a casino, a huge outdoor market, the river and boat rides. I did not go to the amusement park, but it looked decent from the outside. I did go to the casino, which is larger than I expected. It has the classic casino décor, great air conditioning, and of course… a buffet! It is a nice place to stop to rest as well as use the bathroom. The bathroom lines at the market are extremely long, and I am sure they are not the cleanest. After dropping a few bills on the blackjack tables, we moved on to the market. One warning…get ready to plug your nose as you cross the bridge near the casino. The surface of the water is covered by a thick layer of trash. In addition, this ghastly sight is accompanied by a nose-stinging stench. This view made me think twice about ever swimming in the river! The market will be easy to find. Just follow the crowd of people moving along the street. Take this time to practice your patience skills because you are going to need it here. If the mob of people doesn’t give the market location away, the endless view of lamps, bags, socks, food and everything else imaginable will. The prices at the outdoor market are very reasonable, so get that wallet ready! Last but not least, there is the river. The river was the main reason I went to El Tigre, and I have to say it was my biggest disappointment. As mentioned before, it is very dirty. Even still, it is nice to have a change of scenery, and it was relaxing to sit on the edge and people watch. Overall, I would recommend taking a day trip to El Tigre. 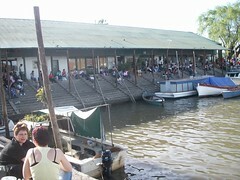 You can have a great lunch, buy many things at bargain prices and end the day with a boat trip! However, if it is clean air, beautiful nature and an escape from the crowds that you seek, you may want to save this trip for another time. That is odd, when we went to El Tigre everything was very clean, and we had a beatiful time. We took a boat trip to a restaurant, we had lunch and we wished we had more time. We came back another time to see the market. Unfortunally it started to rain and the stalls were clossing. But it was very interesting and fun. we travel all over the world and I faund the bathrooms in Argentina very clean defenitly cleaner than here in America. I must add that both our visits were not in the weekeed. I guess everybody has different experiences and see things in a diferent light that is the enjoyment of traveling. If you whant things to look like home. Just stay home. I lived in Buenos Aires back in 1967 and went to El Tigre back then, it was a beautiful place, I’m sorry to hear that it is so polluted now. Not true…Not polluted. I even went swimimng in el tigre. It was fab. I have friends that own houses there for decades and nobody thought the place or the pollution has worsen. Haven said that, I am aware of the impact that boats and people have on the delta…but not drama …so far. Go to El Tigre. It’s beautiful. I’m surprised by this article. I was there this December ’08 and I thought the river area was beautiful. It has a dark color because of the minerals in the water but we took a “bus boat” (an inexpensive one used by locals that stops at various places along the delta) and we took it to a place call Tres Bocas where we got off the boat and walked around a beautiful little island that reminded me of a Tom Sawyer kind of place; small little rivers with beautiful wooden long boats and shade trees. It was really quite enjoyable. We found a number of little outdoor restaurants to eat at and spent the day just enjoying the scenery. People were swimming on the beaches along the way and if we had had swimsuits we would have joined the because it was VERY hot that day. It’s not clear water but it is, after all, a river not a lake. I didn’t see any of the pollution mentioned and certainly didn’t smell anything bad. In the hot humid weather we experienced I certainly think it would have smelled bad if had been polluted. Definitely worth the trip out of Bs.As. for the day and very easy to get to for a day trip. Brown is not the same than dirty. The Parana river is always brown, it’s because it’s a very muddy river… thus it’s not pollution. Dirty and polluted? Sorry, but you are messing. How the Diego said: “it’s a muddy river” Nothing of pollution. We live in Bs. As. one month a year. Just got back. 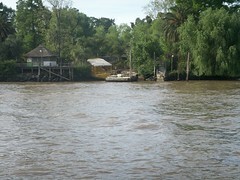 Went to Tigre twice and took a river launch to Tres Bocas out on the Rio Sarmiento. Had a wonderful lunch at Romanesco Resto Bar. Would have rented a kayak if we’d had more time. I don’t know that I’d swim in the river, but the color is from upstream iron deposits. Since you are a Californian, I would suggest that the water quality is very much like that in the Sacramento River Delta. Hello, Buenos Aires has 13.5 million people. 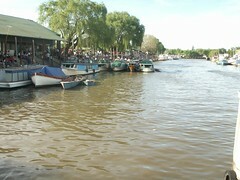 My visit to the Tigre 10/2010 was well worth doing. Yes, you not in a small northern town in Cali, if that is what you expect than stay home. The Tigre was spectacular, could it be clearner, yes, but so can MB and PC in Cali. This page rendered in 0.051 seconds.